Imagine a place where your honeymoon memories are captured amidst an architectural masterpiece complete with 14 massive Doric columns, grand vistas, and centuries-old live oak trees. Where swaying Spanish Moss—powered by the Mighty Mississippi River’s breeze, transfers pre-wedding stress to contentment. Other centuries may have claimed the “Sugar Palace,” but the past is present to you now. 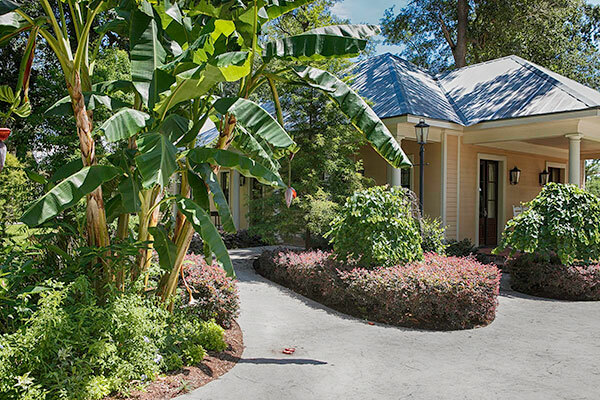 Houmas House Plantation and Gardens has extended their hospitality with the addition of the Inn at Houmas House…your happy place for the important first days of forever. Appropriately tagged the “Crown Jewel of Louisiana’s River Road,” Houmas House reflects the wealthy past when it was the largest sugarcane plantation in America. From the original structure of the 1770’s to the present mansion completed in 1828, the vivacious owners have had something in common…they all welcomed visitors and enjoyed a good party. Little wonder “The Knot” has previously included Houmas House as a top wedding professional in their “Best of Weddings.” While visitors come to peer into the past by enjoying a house tour, restaurants and gardens, Houmas House is also a renowned world-class wedding and reception venue. With the addition of The Inn at Houmas House, the wedding party can lodge on property. When the celebration is over, “your cottage” becomes a romantic honeymoon sanctuary. Houmas House Inn consists of cottages nestled along an alley of ancient oak trees and designed in the Creole-style depicting historic structures of the area. Each room is complete with a single king or queen size bed, or double queen beds with marble bathrooms. Junior suites and deluxe suites are also available. Each romantic room is decorated with old world furnishings so you can experience the lavish lifestyle of the wealthy sugar barons of the early 1800’s. While all the cottages are luxurious, I can give you a tip. Our cottage, # D2, had a piece of history welcoming us that is usually found roped-off in a house museum. It was our dream bed—designed and crafted by the 19th century New Orleans cabinet maker, Prudent Mallard. The 4 poster tester bed soars to the ceiling in dark mahogany. Look up and you know you have been swept away to another century by a piece of furniture. Dressed in fine linens and comfortable bedding, it is only steps away to the double doors leading to your porch. Here, you can spend hours planning the future or simply examining the beauty of lush foliage. While the cottages are a throwback to yesteryear, the bath is modern with a soaking tub and separate tiled showers. At dusk, street lanterns stir memories of old New Orleans where a walk to the property’s three restaurants are mystical. If we were in a hurry, we called the desk for a ride--skirting around the famous gardens while snapping mental images of intimate spots, accented with statues, that we would explore later. The Carriage House, with its baby grand piano, opulent chandeliers and an innovative menu was first on our list. We started off with the Seafood Gumbo—smooth and filled with generous delights from the sea. The Australian A7 Wagyu Filet Mignon was the best we had eaten. For dessert, we never tired of the decadent White Chocolate Bread Pudding while the Grits & Veal Grillades got our vote for best breakfast specialty. Hungry? Try Latil’s Landing, located in the historic original 1773 structure, and inquire about the “Tasting Menu” available with wine pairing. Café Burnside is where we dined for a causal lunch---salads and fried oyster po-boys are delish. Ask the staff to arrange a picnic lunch and find a secluded spot to relax. We found tables and benches sprinkled around the 38 acres of gardens where the pond, fountains and courtyards tantalized the senses. You will find blooms throughout the year in this Eden-like landscape where every bend along the paths has a surprise. Tour Houmas House (the tour and breakfast come with your room). The 16 room mansion is completely restored with fine chandeliers, lush draperies and prized antiques. Dressed in period clothing, our guide revealed a time capsule of historical tidbits, and a window into the fascinating lives of the people who lived at Houmas House. Little wonder it was voted “The Second Best Historic Home Tour,” by readers of USA Today. While varied owners have put their “stamp” on Houmas House, it was the present owner, Kevin Kelly, who elevated the property to its present glory--attracting national and international visitors. We believe he is one of the last true historic property visionaries in the country. Poet Carl Sandberg once said, “You have to belong to the land before the land can belong to you.” Kevin has elevated this historic property to romance central. The dining room showcases the Houmas China, a 1792 chandelier, and chairs that once belonged to President Polk. 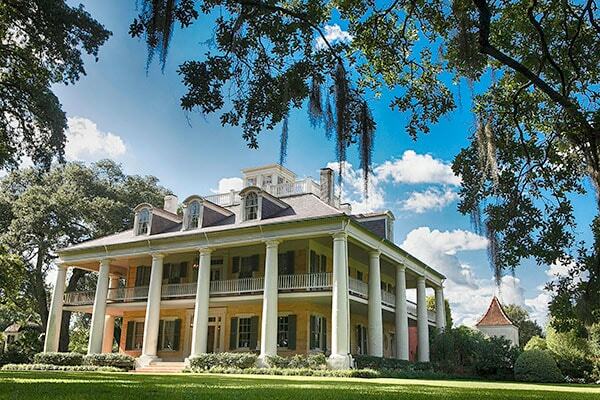 Houmas House is so stunning that film crews abandoned their Hollywood stage lots on numerous occasions to film on location proving this unmatched beauty cannot be duplicated. Be sure and rent the classic movie, “Hush Hush Sweet Charlotte,” that was filmed at Houmas House featuring Betty Davis. 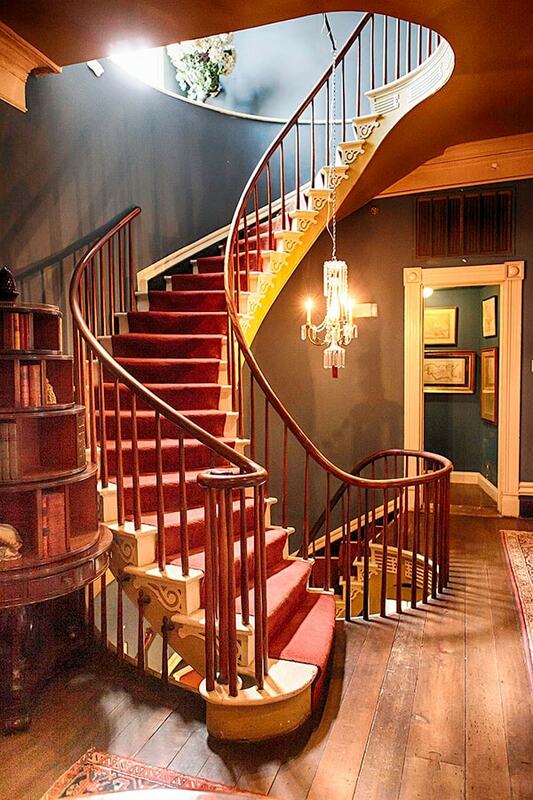 The stunning staircase leads to the room where the actress lodged while filming. Couples travel as far away as Ireland, France, Great Brittan, Japan and all over the U.S. to exchange vows in various places on-property. 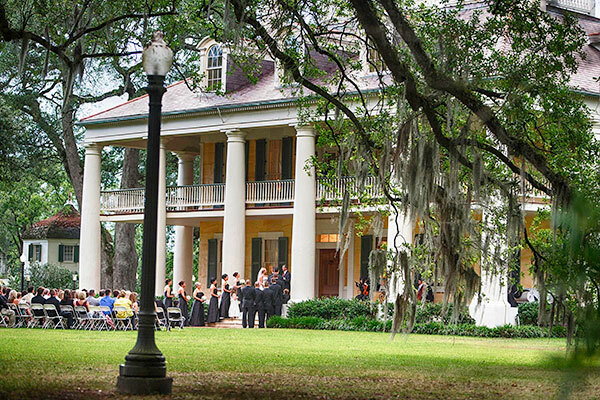 The most popular is the front porch steps of the mansion, with the bride using the alley of live oaks as her aisle. The wedding guests are invited to pass through the Old Kitchen for soup service, on their way to their outdoor cocktail party. The bride and groom sign their marriage certificate in the mansion’s formal dining room, along with immediate family and bridal party, and enjoy champagne and hors d’oeuvres. A meal is provided for the couple, if time permits, before the reception. Other wedding locations include under the Burnside Oak, with its canopy of trailing branches creating a stunning open-air “cathedral,” and under the wisteria arbor with the Hampton Fountain in the background. The Japanese Tea House is another option. There are also expansive indoor spaces where innovative catering offers sophisticated cuisine. For history enthusiasts, leave Houmas House to visit a group of nearby Great River Road plantations, www.PlantationParade.com, that are comprised of Houmas House and three other properties including Oak Alley. 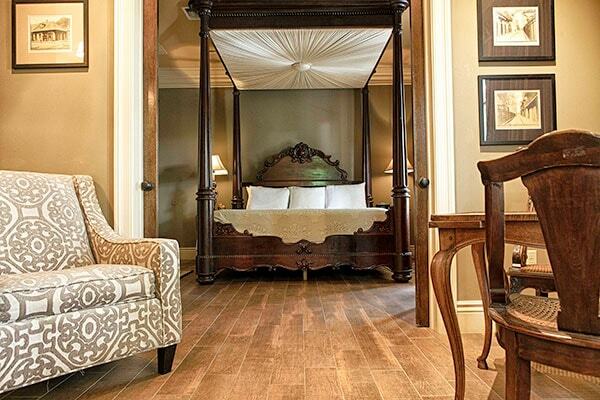 Your first rendezvous as newlyweds should be private—The Inn at Houmas House offers quiet days and lingering nights. Once relaxed, remember New Orleans is less than one hour away. When you return from the energy of the city, notice the clock moves slower here and “nightlife” is translated to an intimate stroll around the well-lit mansion and grounds. A place so special, you take the sobering thought with you that you will never ever be in this exact place and time again. Oh, but your passport to another century doesn’t expire. The Inn at Houmas House will welcome you again for another life celebration. Spend a day or evening exploring the French Quarter where balconies with hanging baskets decorate 1700’s buildings. On Royal Street, zip in and out of some of the finest antique and art galleries in the world. Detour along Pirate’s Alley to the Faulkner House bookstore to visit where the author penned his first novel. 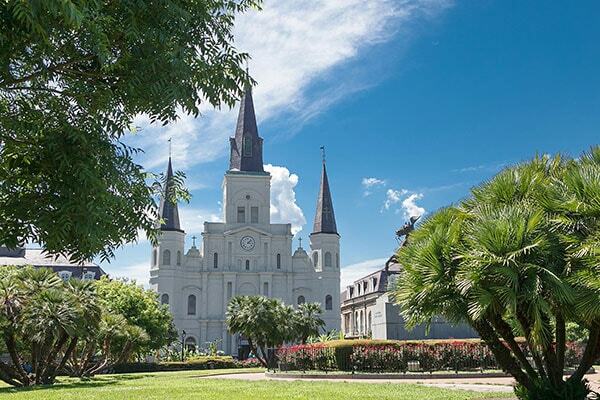 Next, head for Jackson Square, the location of an outdoor artist colony, and catch a romantic carriage ride. 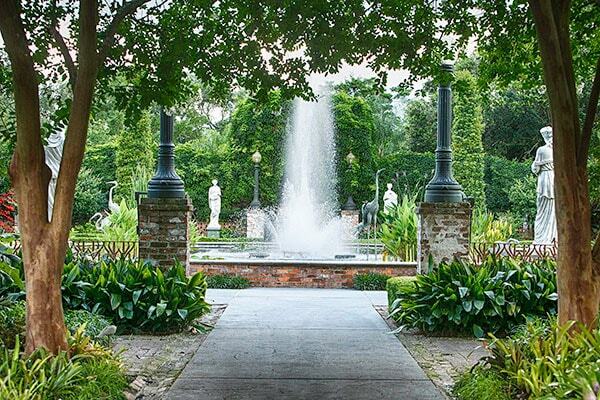 Board the St. Charles Avenue street car to the stately mansions and shops of the Garden District. New Orleans is known as the birthplace of jazz—enjoy Irvin Mayfield’s Jazz Playhouse and Preservation Hall. For drinks, take a spin on the Hotel Monteleone’s famous Carousel Bar—yes it revolves slowly around the room. 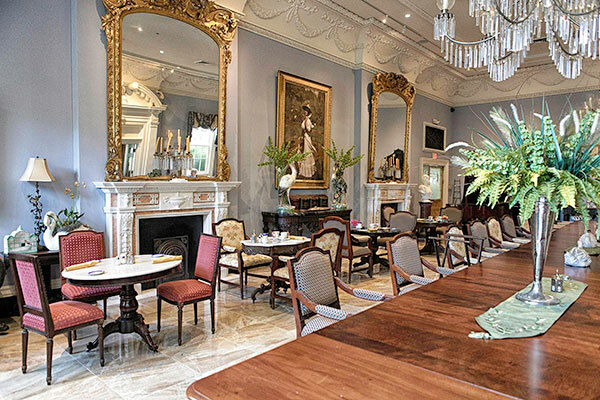 The culinary industry is synonymous with New Orleans where you can enjoy Brennan’s restaurant. You know the pop phrase, “Breakfast at Brennan’s” where Bananas Foster was born. The Eggs Hussarde and Turtle Soup are favorites also. Have a casual lunch at “Mother’s” where their claim to fame is “the World’s Best Baked Ham.” It’s true! Try Criollo at Hotel Monteleone featuring amazing seafood and steaks. For evening dining, make reservations in the romantic Wine Room in Restaurant August. Located in a French-Creole building dating from the 1800’s, nationally known and award-winning chef, John Besh, owns this upscale restaurant. The Breaded Flounder is the most popular dish—rightfully so, and the “Dirt Cake” is a must. Boasting patrons from U.S. Presidents, royalty and celebrities, the legendary Arnaud’s Restaurant has been a New Orleans tradition since 1918. Ask for the table where Benjamin (Brad Pitt) and Daisy (Cate Blanchett) dined in the film, The Curious Case of Benjamin Button. We feasted on Filet Mignon Au Poive and Pontchartrain--topped with crabmeat. The Soufflé’ Potatoes are amazing. Finish with Strawberries Arnaud and Café Brulot—comprised of coffee, lemon and orange rind, cloves, cinnamon sticks and Orange Curacao—flamed with Brandy. Style equals chains, but creativity will set you free. I am a freelance travel journalist who specializes in romance and honeymoon articles.